The Haley Book Bike with display shelves folded out. 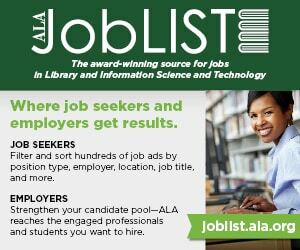 The number of libraries with bicycle-based outreach programs has grown steadily in recent years, in part because these programs can make a big impression for a relatively small investment of time, money, and energy. 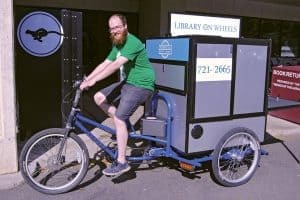 Most bookmobiles require gas, a large parking space, and a significant operating budget, but a pedal-powered library can run on little more than a willing librarian or volunteer. 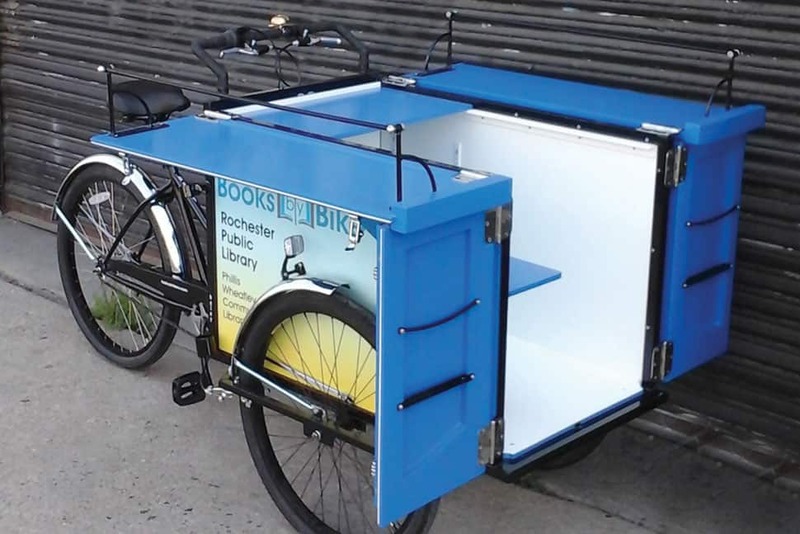 While it’s possible to design and assemble your own library bike, these companies are providing custom-made tricycles and bicycle trailers that are designed specifically for library use. Haley Tricycles has been building book bikes for libraries and literacy organizations since 2008, when the company designed the bike for Gabriel Levinson’s Chicago Book Bike project, arguably the first modern book bike. The Haley Book Bike is based on a display bike format: It has two fold-out side tables with bookends on each and an adjustable shelf inside the box, providing three levels of display for books and materials. The book display box size is customizable, within a length range of 31–50 inches and height range of 13–30 inches. The standard width is 21 ¾ inches to allow the bike to fit through ADA-compliant doorways. A rider can carry up to 260 pounds of books and other items in the front compartment. The bike has independently controlled brakes on each front wheel for additional control while cornering, a coaster-brake rear wheel, and two parking brakes for stability when the display is unfolded. Further customization options include multiple speeds with custom gearing, electrical wiring for lights and charging stations, and additional book displays. In standard sizes, the tricycles can fit through most doorways and into elevators, allowing them to be used for display indoors and outdoors and to be stored easily. For riders who are unfamiliar with operating cargo tricycles, the Haley website offers instructional videos on maneuvering in various situations. The Book Bikes are custom-built in Philadelphia and shipped throughout the US. The tricycle is shipped in two parts and can be assembled with common tools. 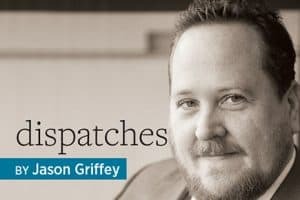 Haley is currently taking orders for delivery in early 2018. The base price is $3,250 for a complete bike. More information can be found at haleytrikes.com/bookbike.html. Coaster Pedicab’s full-size Library Bike with its shelves enclosed for transit. Pedicabs, or rickshaws, are a common sight in many urban areas, with riders pulling people between tourist attractions. Coaster Pedicab, one of the largest operators, recently expanded its bike offerings to include two library-specific models. The full-sized Coaster Library Bike is 50 inches wide and includes a fully enclosed rear box with a canopy, a Bluetooth stereo with marine-grade speakers, LED light strips, brake lights, and turn signals. The electrical system is battery-powered, though the battery is not included. Electric assist—a built-in electric motor that helps to turn the pedals—is available, making transporting heavy loads easier, especially at the bike’s maximum capacity of 600 pounds. For libraries looking for a smaller or lighter mobile library, a 35-inch-wide model is available, which includes an A-frame shelf and canopy. Lighting and speakers similar to those included with the full-sized model can be added for an additional cost. This model’s carrying capacity is 400 pounds. Both types come equipped with hydraulic disc brakes as well as emergency front and rear brakes. Most parts are standard, so maintenance on the library bikes can be done at a local bike shop or by a general bicycle mechanic. Customization options include logos and library branding, custom colors, a circulation shelf, a rear table with detachable legs, removable bookshelves, and locking storage inside the cargo area for personal items. 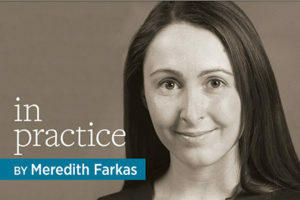 Production times vary, but most orders are completed in 4–10 weeks. The library bikes can be shipped worldwide and are delivered 95% assembled. The full-sized library bike starts at $6,950, while the smaller model starts at $3,950. For more information, visit coasterpedicab.com. 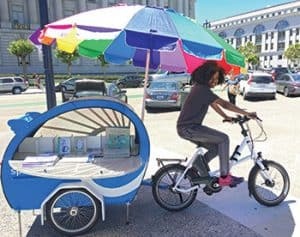 Description: The Burgeon Group’s Bike Library Trailer is an aerodynamic bicycle trailer with shelves, storage, and electrical wiring, designed for public library outreach. How do you use your Bike Library Trailer? Spoke & Word pedals library resources to the people. We’ve streamlined the process for any trained staff to reserve the bike library for outreach events. The trailer serves as a mini-library on wheels. Spoke & Word, a custom library trailer by the Burgeon Group. 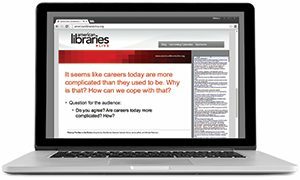 How does the trailer serve your library’s needs? Even with 28 libraries and four bookmobiles, we wanted to be more nimble and inventive with embedding resources into the community. Spoke & Word is the perfect mechanism to bring the library to playgrounds, festivals, schools, farmer’s markets, the Pride Parade, and other venues where locals gather. Equipped as a Wi-Fi hotspot, this pop-up library provides instant access to our nifty e-resources, free books, and library cards. “It’s cooler than ice cream,” according to the San Francisco Chronicle. We worked closely with the Burgeon Group to design its first bike trailer and partnered with the New Wheel to select the e-assist bike. This collaboration created a spectacular bike library program. The combination of the aerodynamic trailer and impressive towing capacity of the e-assist bike help navigate the wind and hills of San Francisco. Inside the trailer there are two bins for books, a portable umbrella, charger, bubble machine, and other outreach necessities. The side doors open to allow for built-in display, and the integrated charging station showcases library materials. From bike enthusiasts to library lovers, it sparks a lot of questions about the design, the bike, and the library. Plus, for staff, it’s a joy ride! What would you like to see improved or added to the trailer? I wish we could figure out how to install a bubble machine on the trailer to spread bubbles as we travel around the city.